We just celebrated Kelsey & William's wedding day a week and a half ago, so of course it's only fitting that our next blog would be their engagement session from just a couple weeks earlier! This wasn't your average engagement session- but then again, Kelsey and William aren't your average couple. Originally, we talked about doing a waterfall session or something else outdoorsy. 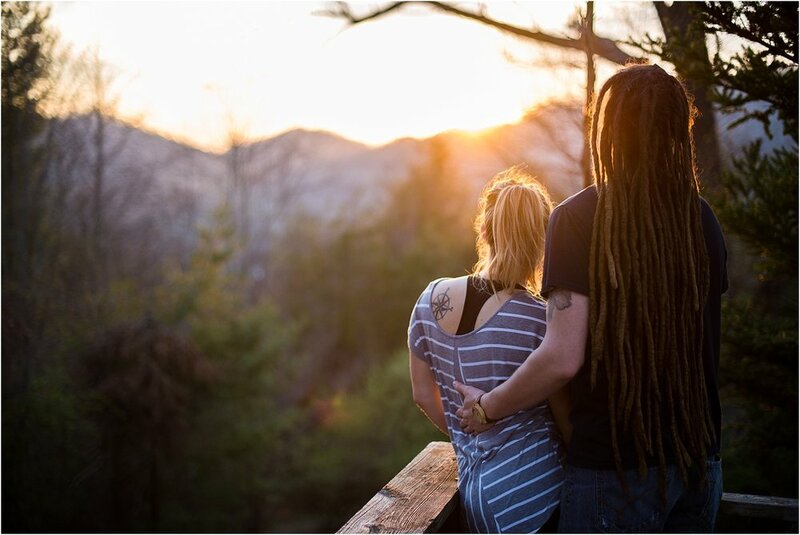 But as their wedding day moved closer, things started falling into place for the couple - and they bought their very first home in the mountains past North Asheville. Kelsey emailed me just a few days before their scheduled session, telling me their good news. As luck would have it, their closing date was the same day as our scheduled engagement session - and it would give them the flexibility to have the session of their dreams with their beloved dogs included. To celebrate and break in their new home, we popped open a bottle of champagne right outside the back door. It was a fitting way to start the session off- the wine bottle had 'I love you' written in all sorts of languages, perfect for these two lovebirds, and a glass of champagne is one of Kelsey's favorite ways to celebrate. One of the things that made this session so unique was how down to earth William and Kelsey were. By the time we arrived, they had literally just finished signing some papers and bringing the very first things over to their new home. Kelsey laughed telling us she had planned their outfits (they were sitting right inside), but honestly they were exhausted! I loved how comfortable these two were in their own skin, that we could catch them on the busiest day of their life and grab some of the most authentic, real-life photos possible without the extra fuss around it. But this post wouldn't be entirely accurate unless we brought up possibly two of the most important 'people' in Kelsey and William's life- their sweet dogs, Dakota and Chuck. Although originally Dakota was William's and Chuck was Kelsey's, they've come together as siblings and are pretty much inseparable. These two have the best time running around their new mountaintop yard and playing with Kelsey and William. Really the sweetest pair I maybe have ever seen. As much as we love including those closest to the couple in photos (whether animal friends, children, or other important relationships), it's one of our top priorities, always, to make sure we get a few with just the couple. Your relationship together is important, and no matter how long you've been dating or what your together-story is, you deserve to be pampered. As life moves on and relationships are added and lifestyles change, it is so, so beautiful to look back on what once was and see how much you've grown, what you've been gifted with, and how beautiful life really is. We were given the perfect sunset that evening. Their new home, on the very tip of a mountain, had nearly 360 views surrounding. The sun seemed to know exactly what we were hoping for- full, vibrant tones to be remembered. Zero prompting for the photos above, Kelsey and William come together so naturally. With the sun gone, we decided to explore their new home. A funky space that used to be exclusively a vacation home, this home will need a little bit of love for them to make it completely their own. But a huge goal with this session was to capture the joy, the real-life, the anticipation behind this huge milestone together - so we braved the funky walls and weird left-overs to celebrate this space and everything that comes with it. William and Kelsey, it's been an absolute pleasure to be a part of your love story! Getting to be a little piece of this day was so special- and being present for your wedding even more so! Can't wait to share more with you.